Grant Johnson is an athlete from Cumbria, who has only taken to competitive running in the last 12 months. However in that short space of time, he has certainly proved that he has what it takes to be a great runner. Grant started running as a means of raising money for a local charity organisation close to his home. During this running journey, he surpassed all his personal expectations. Grant originally bagan training, as he predominately wanted to place well in a 40 mile Ultra Trail event – and that he certainly did, by finishing 1st. Quite an account opener! Then, in the Workington to Keswick 32 mile run, Grant set a new course record – again, not too shabby. In the Greater Manchester Marathon (this time on the Road), Grant took an astonishing 12th place overall, which gave him the title of the fastest U23 Marathoner in the UK so far in 2015. 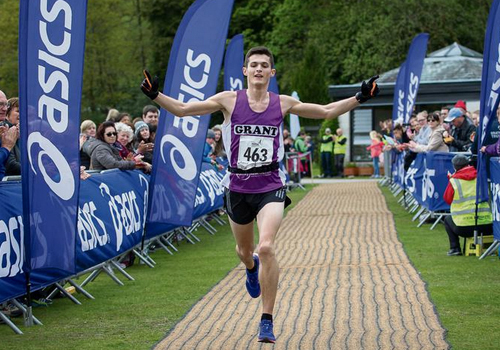 Grant also went on to win the Keswick to Barrow 40 miler and the Brathay Windermere Marathon all within a period of 1 week at the start of May! Through these incredible achievements, Grant’s ability soon became noticed by athletes across the North of England and as a result he is currently training with a group in Preston, Lancashire. He has attracted the attention of GB Athlete Helen Clitheroe, who has taken him under her wing and is now guiding his running career. We think Grant has an amazing future in running and he’s also a thoroughly nice lad to boot – we wish him the very best in his racing for the rest of 2015.